When I meet Vikes women’s basketball player Amira Giannattasio in CARSA to begin our interview, I have ten or twelve questions lined up. Just four and half minutes later, the interview is over. But considering Giannattasio is no stranger to scoring crucial baskets with only seconds remaining, an economical use of time probably ought to have been expected. I sat down with Giannattasio after a tremendous season for the Hamilton-born guard. Playing in her sophomore year after an award-winning rookie season, she has an average of 14.3 points per game (PPG) so far this season — the second highest PPG total for the Vikes and eleventh highest in the entire Canada West conference. And though positive runs of form can be hard to come by for the Vikes this season — the team currently sits seventh out of eleven in the conference with a 6-8 record — Giannattasio remains more consistently dangerous than most. Deadly outside the arc, Giannattasio has the third highest number of successful three-pointers in the Canada West Conference. 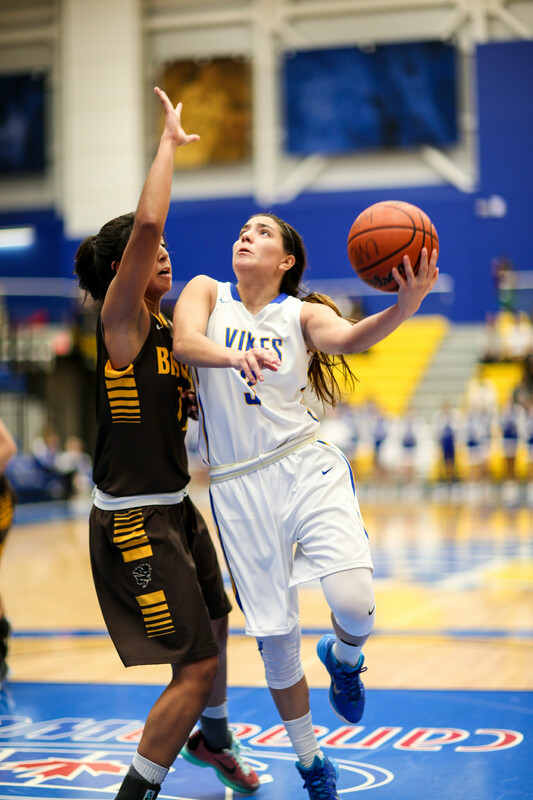 Add that to speed, great dribbling ability, and a ferocious attitude on the court, and it’s not hard to see why Giannattasio is vital for the Vikes — so vital, in fact, that the Vikes are 1-6 in games where Giannattasio has been held to single digits. Plaudits are nothing new for Giannattasio, who joined the Vikes in 2015 after a superb high school basketball career. Playing at St. Mary’s Catholic Secondary School in Hamilton, Ont., Giannattasio was a four-time OFSAA (Ontario High School) champion — an integral part of the first team to win four Triple-A championships in a row. The Vikes were close to missing out on Giannattasio when, as a senior in high school, she pledged her varsity career to Mount St. Mary’s in Maryland. But, with only a few months before the end of her senior year, Giannattasio changed her mind. That’s Jenna Bugiardini — a fourth-year forward and the captain of the Vikes women’s team. She and Giannattasio played for St. Mary’s back in 2010-11, winning an OFSAA championship together. There certainly is something familiar — if not familial — when it comes to Giannattasio and Bugiardini. They share the same alma mater, occupy the first and second PPG percentages for the Vikes, and they’ve even won the same trophies: both won the Canada West Rookie of the Year award in their first years at UVic. Her second season began with additional pressure, with coach Sinclair mentioning that her starting guard was to “be called upon much more for [the Vikes].” Giannattasio admits she is beginning to feel the burden that comes with being expected to perform well. And what will come later? The 2017 Canadian Interuniversity Sport (CIS) Championship lurks just around the corner for Giannattasio and the rest of the team. The Vikes are hosting the Championship and therefore have an assured spot waiting for them in the first round. When I ask Giannattasio how she feels about the Championship coming up, she doesn’t mince words. The confidence with which she answers means I don’t doubt it. And if Giannattasio stays as clinical on the court as she does with her answers, the Vikes can expect big things.